I recently went for a walk in Dunsford Woods – beautiful oak woodlands in the Teign Valley, owned by the National Trust and managed by the Devon Wildlife Trust. There has been a lot of controversy over the past few months about an adjacent intensive pheasant shoot and the impact it was having on the wildlife in Dunsford Woods and the enjoyment of those people visiting the area – I was on a reccy prior to having a meeting with the Director of the Devon Wildlife Trust, Paul Gompertz to discuss tactics about how to resolve the situation. The woods were looking fantastic – the wild daffodils were still in flower but the bluebells had yet to appear. A few summer migrants had arrived – chiffchaffs and blackcaps were setting up their territories and singing loudly. The birding highlight was however a lesser spotted woodpecker – its characteristic staccato call giving away its presence. Lesser spotted woodpeckers are a real rarity now so it was good to know that they are still hanging on in the Teign Valley. A little later in my walk I saw something that I had never seen before. The National Trust along with Buglife – the Invertebrate Conservation Charity, have recently launched a campaign to raise awareness about oil beetles. These are beetles with a bizarre lifecycle. The adult beetles lay eggs which hatch into larvae which then sit on flowers waiting for a solitary bee to arrive to feed on the nectar. The larva then hitches a ride on the bee back to its nest where it then feeds on the bees’ grubs. 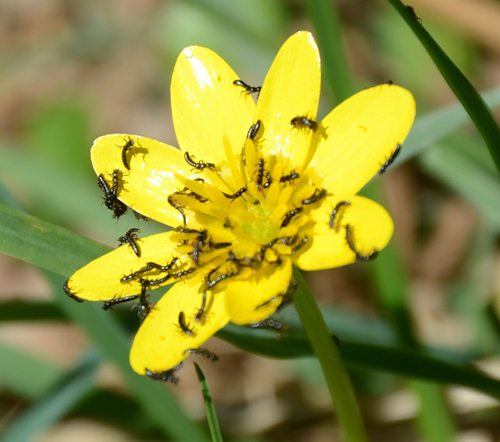 I knew the life cycle of the oil beetle but had never seen the larvae, that is until my Dunsford reccy where I saw a celandine flower covered in tiny insect larvae – these were oil beetle larvae – the so called triungulins! This entry was posted in Dartmoor wildlife and tagged Spring, Wildlife, Woodlands. Bookmark the permalink.